This October we welcome independent curator Julie Niemi to Stavanger as the second 2017 CAS Resident in Art Writing. Niemi's deeply invested in publishing and collective production, and integrates these methodologies into her curatorial practice. Below, Niemi talks with CAS about her past projects, current research, and what she's planning for her residency in Stavanger. 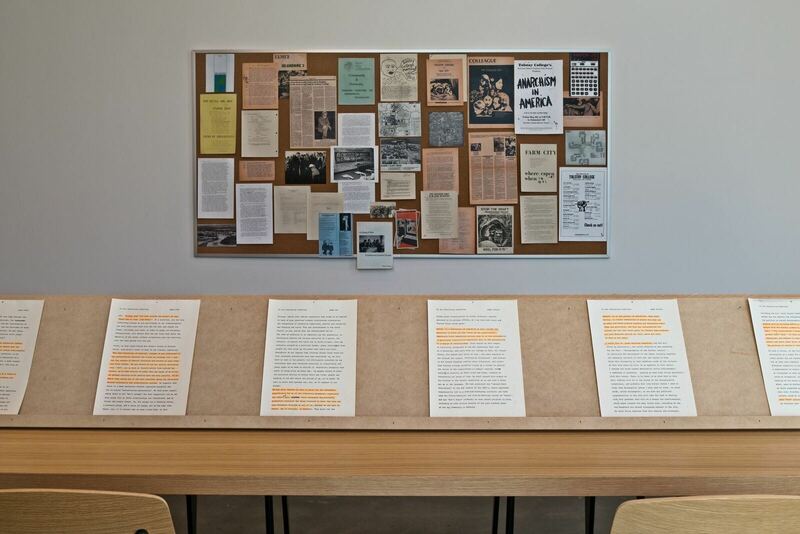 Installation view of archival materials in the exhibition, Studies from the Bottom Up, Hessel Museum of Art at The Center for Curatorial Studies, Bard College, 2017. Heather Jones: You have a Master of Arts in Curatorial Studies from the Center for Curatorial Studies at Bard College. Can you tell us a little more about your background? How did you arrive at curating as your chosen career field? Julie Niemi: I’ve been interested in organizing events ever since I was a teenager in Tulsa, Oklahoma. It took me a while to realize that curating was a thing, a career I could actually do, until I was a student of Arts Management at Columbia College Chicago. While in Chicago, I started actively looking at art and writing reviews. After I graduated from Columbia, I moved to Los Angeles and started a magazine, VIA Publication, which really sparked my interest in curating and eventually landed me a job at the Museum of Contemporary Art, Los Angeles. In 2015, I made the decision to move from doing primarily administrative work in a museum/gallery context to focusing on studies surrounding curatorial practice. This interest lead me to pursue my graduate studies at CCS Bard in the fall of 2015, where I graduated in May of 2017, and co-ran The Barn, a project space in the Hudson River Valley. Since I left Bard, I still am a member of a the curatorial collective, Anne-Marie, which I formed as a graduate student. HJ: I understand you have a vested interest in publishing practices in the arts, and have held an editorial role as several journals including aCCeSsions at Bard College and VIA Publication. How do you view the relationship between writing/publishing and curating? JN: I am really interested in how editing and organizing a publication – whether digital or print – can be a curatorial project. 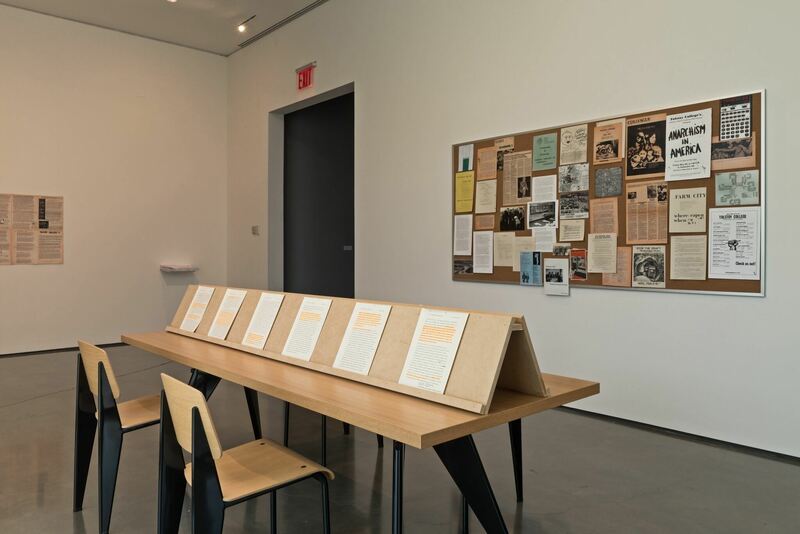 I am invested in research-based archival exhibitions that connect broader social and political histories to contemporary art and media practices. I view this as a heavily editorial-based research process, where it boils down to research, processing, and editing down information. This has certainly progressed since the time of running VIA, which, along with five other editors, was a project invested in, and concerned with, understanding the developing artistic terrain of LA. The process all really boils down to how the research and work needs to get done in regards to what the object of interest is that I am looking at. Issues of VIA Publication. Image courtesy of Julie Niemi. HJ: In previous conversations, you’ve expressed a vested interest in alternative educational models. Can you tell us more about your research? JN: In my most recent research, I looked into a minor history of an anarchist college that was nested within a larger state-funded institution. This took the form of a research project, which was developed through a book and exhibition on Tolstoy College, an anarchist educational community active at the University at Buffalo in the 1970s and ‘80s. For me, this case-study of Tolstoy College was the ideal investigation into themes of radical, alternative, education models I was interested in, specifically active in the United States. This came into fruition within my thesis project, titled Studies from the Bottom Up. I am still working on continued research on this topic, which I hope to turn into a further- researched book on the topic in the next few years. 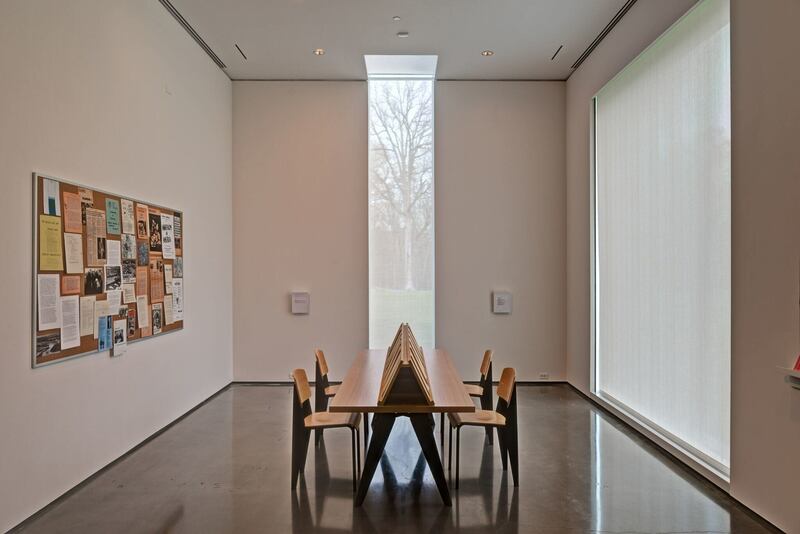 Installation view, Studies from the Bottom Up, Hessel Museum of Art at The Center for Curatorial Studies, Bard College, 2017. HJ: You’ve also engaged with experimental film and media, and curated an exhibition of K8 Hardy’s work at The Barn, a project space in New York. What about this media specifically do you find engaging and relevant now? JN: Good question. 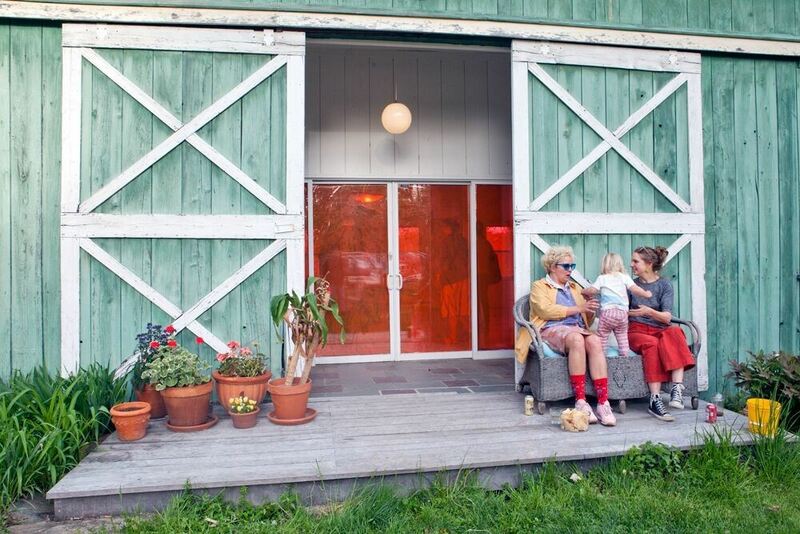 The curatorial projects hosted at the Barn were never loyal to any medium – it was really contingent on what the domestic space of a barn provided. With that said, it was definitely prone to more intimate events such as: readings, small scale film screenings and and exhibitions, as well as workshops. The space was very contingent on what my collaborator Lola Kramer and I, were able to show, which I thought was especially interesting, and a commentary on, how one can work with a particular space at hand and with resources that are readily available to you. 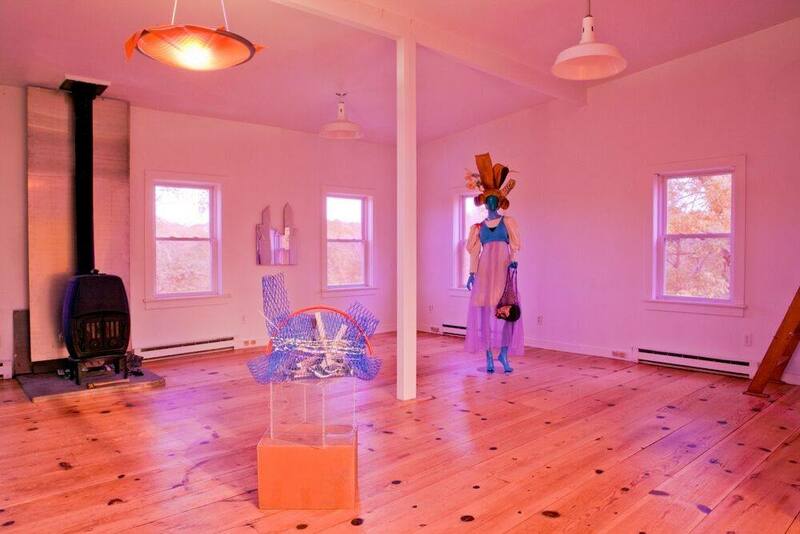 Installation view, K8 Hardy: Undergirding Heroine Ensemble, The Barn, 2017. Image courtesy of Julie Niemi. HJ: We’re looking forward to having you in Stavanger in early October as one of our 2017 residents in Art Writing. Do you have any specific goals or research focuses that you’re hoping to explore while you’re here? JN: I am looking forward to meeting as many artists, designers, writers, and theorists in Stavanger as possible! Although the residency is quick, I am very excited to jump into some questions just in terms of how people live and work in the city, what the main industry is, and how the city is architecturally made up. I am also really interested in taking some time to develop a plan and strategy for a future project space I am in the midst of developing with a friend, collaborator, and part of Anne-Marie. HJ: Apart from the CAS Residency, do you have any current research or upcoming projects that you can tell us about? JN: Currently, I am writing a longer essay on and loosely about Tolstoy College as well as collectivity both in and outside of institutions. I am taking things one day at a time, trying to develop a consistent journaling practice and giving myself space to reflect on life and the insanity of living in the US during this particular political milieu. I am also currently writing this while on an epic road trip across the Midwest and down to Oklahoma. Along the way, I am meeting with new people, seeing old friends, and interviewing for jobs, which has given me some time to further reflect on current research interests and next big moves. With that said, I’m thinking about proposals and curriculum as a sort of medium and plan for future thinking and as materials for research and understanding a work in process. I hope to have more of this research done in order to present on this while in residence at Stavanger. Julie Niemi (b.1988, Tulsa, Oklahoma) is an independent curator, publisher, and project manager currently based in New York. She received an M.A. from the Center for Curatorial Studies, Bard College, where she was commissioning editor of aCCeSsions and researched Tolstoy College, an anarchist educational community active at the University at Buffalo in the 1970s and ‘80s. From 2013–2015, she was co-founder and editor of VIA Publication. Her writing has appeared in Frieze, Temporary Art Review, and Art21 Magazine. Her recent exhibitions and publications include: Studies from the Bottom Up, K8 Hardy: Undergirding Heroine Ensemble, and All Things Scene. Previously, Julie has held positions at and provided editorial support for: Henie Onstad Kunstsenter, Oslo, Norway; Museum of Contemporary Art, Los Angeles; RAM Publications, Los Angeles; Project Projects, New York; Inventory Press, New York; and East of Borneo, Los Angeles. She has given talks at UCLA, Independent Curators International, and Threewalls. She is part of the curatorial collective Anne-Marie and co-ran The Barn.